NEW PRICE! Single story Cataic home encompassed by a sweeping corner lot with picturesque mountain views! NO HOA fees or Mello-Roos. This home features professionally landscaped front and backyard, fresh paint, tile floors throughout, new garage door and tons of storage cabinetry in the garage. Newer water heater, Cooling systems have been upgraded for energy efficiency. The kitchen boasts upgraded stainless steel appliances, accent lighting and bright white cabinetry. The bathrooms have low flush fixtures and white cabinetry. The spacious backyard is encompassed by the scenic views and features patio hardscaping, latice with projected style patio covers and grass areas. Proximate to the esteemed elementary and jr. high school with a brand new high school opening in the fall of 2019. 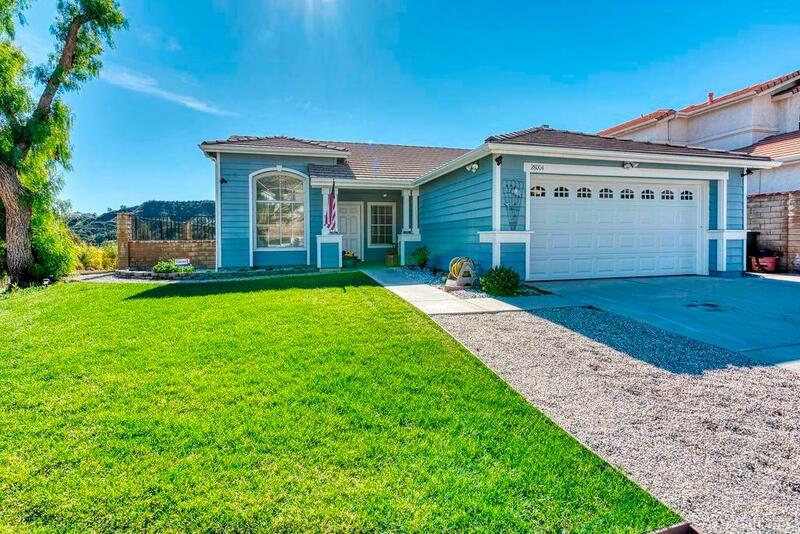 Minutes from Castaic Lake, community and shopping conveniences. Plus, Stevenson Ranch Marketplace, Valencia Town Center & more are freeway and The Old Road close! Don't miss the opportunity to purchase this rare find of a home.